In June of 2012, the Society of Gilders formally opened the Museum of the Gilding Arts in the city of Pontiac, Illinois. The museum currently is a small exhibition space located inside the Walldogs Mural Museum, located on the square in the heart of Pontiac. 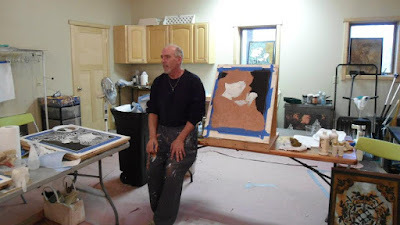 The room devotes space to "What is Gilding? ", items from the Swift Collection, "How Gold is Made" with photos and video from Guisto Manetti Battiloro - SpA (gold leaf manufacturer), a case of gold beating tools, antique signage, a section on "How To Gild" with various gilding tools, leaf and equipment, a visual demo of the steps involved in both mordant and water gilding, and then two walls of member works entitled "Where Do You See Gold Leaf?". The latter is an opportunity to show visitors the everyday places that they can see gold, from window lettering to fine art, to architectural items, frames, mirrors and everyday items. Pontiac, Illinois is a vibrant small city about an hour drive southwest of Chicago, located on the historic Rt. 66 highway. When the recession hit, and most small towns were hoping for state and federal government intervention, the City decided that their fate was in their own hands and banked on tourism to keep their city vibrant. As a result, the City is a model community for restoration and tourism development. Pontiac boasts an variety of museums and attractions which, together with frequent regional events,drawing visitors from around the world to this charming mid-western city. As part of our Grand Opening, which was held on June 29, 2012, Society members gilded a ribbon ornament on the City's Desert Storm monument, located on the ground of the historic County Courthouse, across the street from the museum. In 2014, we will be working on an expansion of the museum, which will include a gallery as well as a gift shop. The Society of Gilders became the proud owner of the Swift Collection in 2007. M. Swift & Sons was a Hartford, Connecticut business whose specialty was gold beating and the manufacture of gold leaf products. When the business was started in 1877, Swift was beating gold by hand in order to produce leaf. In the early 20th century, machines began doing part of the process of making leaf. M. Allen Swift, a fifth generation gold beater and the last owner of the business, was one of the last people in this country to beat gold entirely by hand. When the business closed in 2005, Allen had the foresight to save the gold beating shop as it was used. He created a private museum where the shop was rebuilt exactly as it had been. The Swift family donated the collection to the Society of Gilders in 2007. The collection includes eight gold beating stations, gold packers desks, chairs and stools, mallets, cutches and packing materials, melting crucibles and other tools and equipment used on a daily basis from 1877 until approximately 1920. The collection also includes signage, items from other companies that the Swift Company acquired over the years, documents, photographs, awards and even some trade show display items. 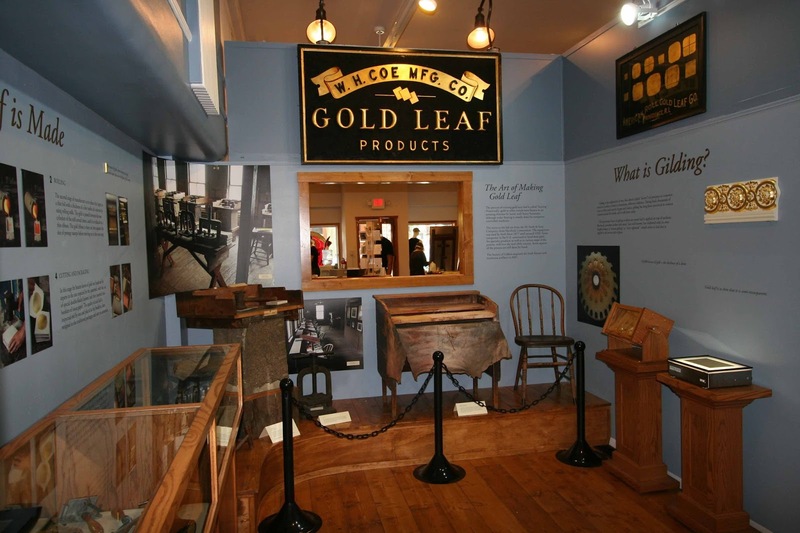 The Museum of the Gilding Arts currently displays one beating station and stool, one packing desk and chair, numerous pieces of equipment and tools and two display signs from Swift. The photo above and to the right shows the current Swift display area. Over the next year or so, as the Museum moves to larger quarters, we will be able to recreate parts of the factory. This article is from the Society of Gilders.